Born in 1914 into a family of samurais, who had become captains of industry in the Meiji modernization period, Itsuo Tsuda rebelled, at the age of sixteen, against his father’s will to make him the heir of the family’s fortune. Refusing to follow the path that had been designated for him, he left his family and set off as a vagabond in search of the freedom of thought. In 1934, having reconciled with his father, he decided to go to France to study, where he followed the teaching of Marcel Granet, the Chinese scholar, and Marcel Mauss, the sociologist, until the outbreak of the Second World War. In 1940, he was called up and had to go back to Japan. After the war, while working for Air-France in Tokyo, he took up an interest in the cultural aspects of Japan and in particular the art of Nô reciting, studying with Master Hosada from the Kanze Kasetsu School. 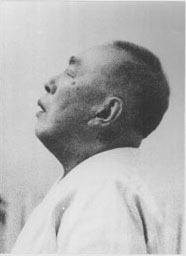 During this post-war period, around the age of thirty, Itsuo Tsuda also began studying Seitai with Master Noguchi, a learning which lasted about twenty years. He is forty-five when he meets Master Ueshiba, the founder of Aikido, to whom he will remain a student until his master’s death in 1969. Once in Paris, Itsuo Tsuda began to write and developed a passion for this work; he started to spread his manuscripts using whatever means that were at hand. A group of people, who had organised a demonstration in his favour in 1969, invited him to use an association they had founded, which permitted him to get better acknowledged with and to consider the European state of mind. In 1973, his first book The Non-Doing was published by the French editor Le Courrier du Livre. His workshop calendar in 1983, ten years later, gives an indication of how active he was with introducing people to Katsugen Undo and Master Ueshiba’s Respiratory Practice across Europe. Nonetheless, during all these years, Master Tsuda, deceased in 1984, always regarded the chief part of his work to be the writing. He published nine books, in French: The Non-Doing, The Path of Less, The Science of the Particular, One, The Dialogue of Silence, The Instable Triangle, Even though I do not think I am, The path of gods, Facing Science.